School programs and camps can benefit greatly from a handout item like the Fun Kit. 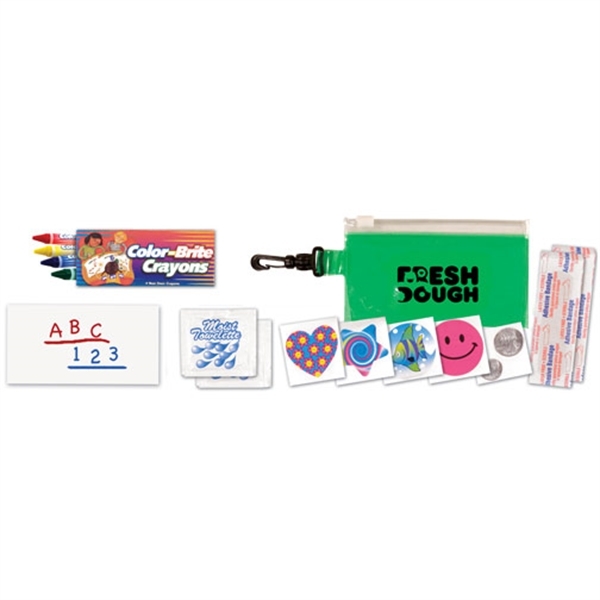 This 4.9" x 3.1" kit includes 1 box of Color Brite Crayons, 1 doodle pad with 5 blank pages, 2 adhesive bandages, 5 stickers and 2 moist towelettes. The contents in the case are unimprinted; however, the bag can be imprinted with a personal message or your company name or logo thanks to the silkscreen capability. Size: 4.9 " x 3.1 "
Imprint Size:3-1/2" W x 1-1/2" H on bag. See individual product listing for printing on the Box of Crayons.